David Tennant returns to Big Finish for a second round of audio adventures, this time bringing his first companion Rose Tyler (Billie Piper) along with him. This is an iconic duo from the show, and having them back together is surely to be exciting for fans. 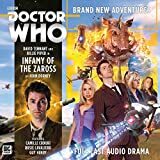 The opening story (Infamy of the Zaross) also brings Camille Coduri back as Rose's mom, Jackie Tyler, who calls Rose and the Doctor back to Earth to deal with an alien invasion. But this ends up being no ordinary invasion. I wont give it away, but I rather liked the twist on this episode. It had a lot of good social commentary, and felt not only like a great premise for Doctor Who, but also felt exactly like the kind of story that would fit perfectly within the period of Doctor Who this set revisits. 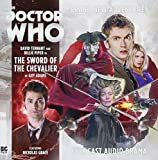 The second episode in the boxset is The Sword of the Chevalier, which takes place in the past and featured the Doctor and Rose meeting the historical figure Chevalier d'Éon, a person I'd never heard of before but, after reading up on it, I find to be a fairly interesting tale. It's a story that mixes humor and adventure well, and features a nice creepy alien threat as well. Cold Vengeance, the third and final story in the set is possibly the only letdown. It isn't necessarily a badly told tale...but it just feels generic, and features what is possibly one of my least favorite of the "classic" Doctor Who monsters - the Ice Warriors. I know that I am probably in the minority on this one, but the Ice Warriors just never felt particularly interesting to me. And really, the only thing this final episode has going for it is that you get to hear the Tenth Doctor face off against them. There is really little else driving the story, at least nothing that felt fresh or new enough. Ultimately, this is a great set, well worth getting. Tennant slips back into the Doctor like he never left the role, though I do think it took Piper a little longer to slip back into the voice of Rose. But if you loved these two as a team, you should be thrilled to get this set. It feels like slipping back in time, to those early days of the shows revival. Recommended! Titan Comics' run of Ninth Doctor adventures concludes with Volume 4: Sin-Eaters, a collection of stories featuring the Ninth Doctor, Rose and Captain Jack Harkness, except this time around, Jack has left the TARDIS in disgrace! 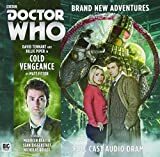 The first arc of the two contained in this collection sees the Doctor imprisoned in an outer space correctional institute, accused of murdering his newest companion, Tara. Rose goes undercover to find him and discovers terrible experiments are being used to purge the institute's resident criminals of their darker personalities Ã¢ÂÂ experiments that create monstrous beings from the subject's dark personalities. Suffice to say, the Doctor is no exception to this fate! We've seen the Doctor's dark-side manifest as the villain in multiple stories on television and beyond before now but both writer and artist find an interesting new angle on this idea, especially in the artwork from Adriana Melo, which has echoes of The League of Extraordinary Gentleman's grotesquely deformed Mr. Hyde to it. Great as the idea is though, the mere two issues it plays out in never quite seem enough, especially when writer Cavan Scott adds in an additional plot thread regarding the institute's power source. A rushed conclusion with little time to dwell on the emotional fallout the story kicks up doesn't help much either. The Sin-Eater arc ultimately wraps up too quick to truly satisfy, with many potential story avenues going unexplored in favour of mass carnage and a burning need to quickly move on to the continuing plotline surrounding the absent Jack Harkness. Picking up on the dangling plot thread that is Jack's missing two-year memory, Scott lets his imagination run riot with a fine flashback tale that gives us a glimpse of the Captain's Time Agent exploits, before dovetailing into a Blade Runner-esque sci-fi noir adventure that sees Jack attempting to find the key to his missing memories and hunt down an elusive figure from his murky past. As a finale, it satisfies, though a needlessly shoehorned-in classic villain, a rather convoluted conclusion, and a very rushed goodbye does make it a hard story to truly love. There are some great Time War references peppered throughout though that certainly adds another interesting layer to the legendary conflict that would make a great story arc in and of itself. Overall Sin-Eaters is a decent if somewhat rushed conclusion to the Ninth Doctor's current comic book adventures. Scott delivers plenty of references and fun Easter Eggs for fans to spot, whilst the artwork, whilst occasionally rough, does lend itself well to both arc's respective tone. If you've waited with baited breath to discover more about Jack's mysterious past, you may be disappointed or even a tad confused, but as an epic Ninth Doctor finale, Sin-Eaters certainly has no sins to confess! Bonnie Langford (Mel Bush), Julie Graham (Carolyn), Jade Anouka (Danuta), Todd Heppenstall (Stuart Dale), Clare Calbraith (Orla), Louis Tamone (Vinny), Ignatius Anthony (Lee). The second installment of the recent trilogy of adventures for the Seventh Doctor alongside Ace and Mel finds them coming back to a fairly familiar setting of Merseyside in 1991. It seems slightly odd that having had several previous adventures set in Liverpool owing to the presence of former companion Hex that neither he didn’t even rate a mention. This combined with Ace’s more youthful persona which has shown through in recent audio adventures has led this reviewer to wonder if this series is set prior to the arrival of Hex although for reasons that will be elaborated on in my review of the next release this seems unlikely. Leaving these minor gripes aside, it seems appropriate to put Ace and Mel into a time which might have been contemporary if this series of adventures had followed on directly from the TV series’ cancellation in 1989. As such we are introduced a new element of Mel’s backstory in the shape of her ex-boyfriend Stuart, played by Todd Heppenstall who has an instant rapport withBonnie Langford that allows the listener to believe they really could be old university chums. In this story Stuart appears to have had a significant reversal of fortune since he and Mel last met as he is now managing a shipyard which seems to have bucked the trend of the early 1990s recession and be successfully ship-building with the help of his mysterious financial backers, the Dark Alloy Corporation. At this stage enter the sinister Carolyn, played as a fun villainess byJulie Graham, it isn’t spoiling too much to reveal that she is a character with much more going than on than is initially revealed. This is an enjoyable tale of double-crossing, alien espionage, the science of magic and a reinforcement of the old fable that you should never go into business with mysterious strangers who probably aren’t human. Whilst Ace and the Doctor get into all the usual sort of trouble, and as ever Sophie Aldred and Sylvester McCoy are on great form as usual, this story really belongs to Bonnie Langford’s Mel. For the first time since she rejoined the TARDIS crew last year (and indeed since she left originally left Pease Pottage with the Sixth Doctor – see the novel Business Unusual and the 2013 audio play The Wrong Doctors) we see her back in rightful time and place and seriously tempted to stay there. Overall another fun story to accompany The High Price of Parking, although listeners will possibly hope for something with a little more originality from the concluding story for this year The Silurian Candidate. Tom Baker’s seven year reign as the Doctor undeniably produced some of the most memorable villains to have appeared on the television show, with Robert Banks Stewart’s Zygons being somewhere at the very top of that list. Indeed, despite only (initially) appearing in the 1975 four-parter “The Terror Of The Zygons”, the shape-shifting extra-terrestrials are apparently David Tennant’s ‘favourite monster from the show’. Roll forward a staggering thirty-eight years to the 50th anniversary special "The Day of the Doctor", and the refugees from the planet Zygor finally made an indelible mark on the science fiction programme by joining the likes of the Daleks, Cybermen, Ice Warriors and Sontarans, as one of the travelling Timelord’s repeated foes… and subsequently also the subject matter of another of “Warlord Games” 38mm scale metal model sets for their “Doctor Who: Exterminate!” miniatures game. Clearly sculpted to capture the likeness of the “shape-changing humanoids” as they appear in the 2015 episode "The Zygon Invasion" as opposed to their Loch Ness encounter with the Fourth Doctor, these incredibly detailed miniatures only prove to be something of a slight disappointment in the fact that there are only two figures per box; as opposed to the three models found inside the Nottingham-based company’s Judoon and Silence sets. Admittedly, this does mean that the orange sucker-covered aliens can be purchased at a lesser price to those aforementioned expansions, but due to the nature of their stances, I certainly found it hard to significantly ‘bend’ any arms in order to create even a semblance of variety with additional Zygons. Fortunately, “Warlord Games” have apparently listened to fan feedback on this tiny issue, and are hoping to produce a third pose in the future. In addition, the two sculpts currently available are absolutely spot-on, and are simply packed full of deadly menace and disconcerting viciousness; especially the one whose arms are slightly raised as if it’s about to launch a devastating electrical discharge attack. As with the Judoon and Silence sets, non-collectors wishing to use the miniatures with the “Doctor Who: Exterminate!” rule-set, may become a little disappointed that the faction’s official Recruitment and Adventure cards can only be found within the miniature game’s starter box, and don’t actually accompany the models. Abilities such as “Poison Barbs”, “Call For Help”, “Friend Of Foe?” and “Conceal Identity” really help imbue a Zygon force with all the menacingly stealthy tactics of their television counterparts, so, at least until “Warlord Games” finally manage to post PDFs of them on their website, it really is worth investing in the game’s main boxed set in order to get your hands on these cards. If previous release The Night Witches seemed custom made to highlight the limitations and contradictions of the Early Adventures format, The Outliers is a showcase for it reaching its full potential. The first thing to immediately strike you is how well Anneke Wills’ narration is integrated into the script. Although I’m still highly sceptical of the need for narration in a full cast audio, nary a line here is redundant or duplicates character dialogue. Instead, writer Simon Guerrier has smartly concentrated the Narrator’s role on providing atmosphere and tension – with lots of lingering verbal imagery of the dank caves, dark running water and unsettlingly empty houses that populate his tale. The opening sequence of a dead body floating downriver, unwitnessed and alone, until something under the water snatches it down, feels perfectly in tone with a typical Troughton story’s beginning, but only accomplishable with narration. It’s the same meticulous recreation of style that gives us huge estates of absolutely identical prefabricated houses – which would have been a perfect budget-saving measure on TV in 1967.The performances of the cast also strike much more truly this time out as well. Although still saddled with a dazzling number of voices each – Wills doing triple duty as Young Polly, Old Polly, and Narrator at different points, while Hines has to make the Doctor, Young Jamie and Old Jamie distinguishable from each other. In fact, hearing Wills perform as both the Narrator and a Polly that’s her own age gives a new respect for just how brilliant she is. Hines, though, impresses most here, aided by dialogue that takes pains to make the Doctor feel as Troughtoneseque as possible on the page and which takes the pressure off Hines to inject 'Troughtonness' into generic lines. The combination of Guerrier and Hines allow actor to disappear completely into the role and the gaping hole you’d expect Troughton’s absence to cause is only rarely, and momentarily, noticeable. In fact, the characterization is top notch all round. Jamie is very effectively used, the young highlander, full of courage and naivety in equal measure but quick to imagine his companions are having a slight joke at his expense with some of their more outlandish claims of aliens and technology. And there’s a keen sense of the story’s placement in mid-Season Four, with a slight edge of jealousy between Ben and newcomer Jamie over the affections of a Polly who just rolls her eyes at their posturing. The plot into which all this atmosphere and characterization is poured is the type of light satire which often found a home in late 1960s Doctor Who, though its targets are slightly more modern. Set in that most well worn of Troughton Era locations – a future Earth colony base coming under siege by a force that moves, insidious and largely unseen as it slowly wraps its lethal tentacles around and through the settlement until the danger is realized too late. Even for that trope The Outliers’ setting is a colony on the edge. A cave system buried deep not even into a planet, but an asteroid hurtling through space, it’s both a mine extracting a highly toxic material for use in Weapons of Mass Destruction, and a construction site for a city of exiles from an overcrowded Earth. The only indigenous life is a type of barnacle; a tiny, simple shellfish which clings as precariously to the rocks as the human settlement does to viability. But they do have one strange mystery – nobody has ever seen their young. A kind of mix between Star Trek’s The Devil in the Dark and Doctor Who’s own The Macra Terror, where the colony’s leader, or “Cohesion Interface Manager”, Tipple (Alistair Petrie), uses statistical trickery to try and disguise the scale of a problem or the ever increasingly rate of mysterious disappearances, this is the situation into which the Doctor and friends find themselves falling. Fortunately, the Doctor still has his “Earth Examiner” badge on him so swiftly takes charge of the situation. Actually, part of the fun of the play is the segment where, having successfully, and almost accidentally, overthrown the asteroid’s leadership the Doctor has to grapple with the headaches of being the one in charge, instead of tutting from the sidelines (an idea which, between Ruler of the Universe, Time in Office and this, seems riding a be a bit of a zeitgeist at Big Finish at the moment.) More humour is mined from Tipple’s over-reliance for buzzwords and management speak. Even the title “The Outliers” refers not to the name of the monsters or the purpose of the base, but to the term dismissing the ever increasingly number of victims as no cause for concern. But the humour never threatens to suffocate the elements of horror or moral questioning. In the manner more typical of newer Doctor Who episodes, the conflict is, in part, fuelled by a misunderstanding but the idea of creatures whose perception of time and reality is so different they can’t at first quite detect that the humans are sentient beings is interesting stuff. While sequences of isolated boats stalked by the giant creature beneath the surface or, worse, people overboard treading in the knowledge that they’re not alone are never less than thrilling.The story is buoyed by a great guest cast too. Petrie hits the right balance between bland corporate nothingness, and the real human being underneath, and gives probably one of the most credible ‘Base Commander Cracking Up’ performances decades of Bases Under Siege have thrown up, while Debbie Chazen and Matilda Ziegler both sidestep the ‘sitcom’ expectations some listeners may have had of them to turn in skilled, dramatic performances. An Early Adventure which manages the rare tightrope walk of being a perfect evocation of the original era without sacrificing any modern standard of characterization or storytelling, The Outliers succeeds in justifying the whole concept of re-casting. For it would be a sadder Doctor Who cosmos in which this wonderfully, spooky little tale didn’t exist. Titan Comics first year of adventures featuring the Twelfth Doctor (and Clara) are collected together in a lovely book with an admittedly daunting page count. At around 400 pages, it is almost intimidating. And when the first story is rather humdrum it looks even more daunting. But luckily, from the second story on, it is firing on all cylinders, and becomes quite the enjoyable read which is rather hard to put down. Like I said, the opening story is mediocre, with a standard Doctor Who story mixed with mediocre (sometimes downright bad) artwork, and it had me a tad concerned about what I was in for. But the second story had better artwork and a more interesting story. The likenesses, as well as the voices, of our characters shined a little brighter. And by the time we get to the third story, The Fractures, it has hit it's stride. I won't pretend the entire book is without flaws after that, "Gangland" only sort of works, but what Doctor Who series is ever without a dud or two. And that is really key to this books success, it feels like a season of the current show. Much as the Third Doctor's mini-series felt like a story plucked out of his era...this Twelfth Doctor ongoing series feels very much like the modern show. There are some wonderfully creative stories, monsters, and sci-fi concepts...and some of the art is just downright tremendous. The ongoing arc throughout the book is seeded in the opening story, and is teased throughout each story, and comes back to bite the Doctor and Clara in the big four-part conclusion. The Hyperions that play the role of the big baddie of the book are a really cool alien concept. Beings that are basically walking suns that went mad...only in Doctor Who can you come up with something that unusual and have it feel at home in this universe. Despite a rocky start, "The Twelfth Doctor - Complete Year One" is a triumph. It's a good read, one that I think even casual fans could find enjoyment in. It doesn't feel full of references, and it doesn't require that you've seen any specific episodes. Obviously being familiar wit hthe Twelfth Doctor, and probably a bit of background from his first series at least might help you understand the characters voices a bit better, but I would say this is an entertaing collection of comics. Certainly recommended if you, like me, hadn't yet had a chance to jump into Titan's ongoing Twelfth Doctor stories, or just prefer the omnibus collections.